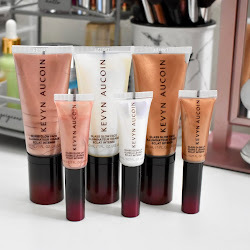 Today I have a look at a few new products from Hard Candy that can help with setting your makeup and making it last all day. 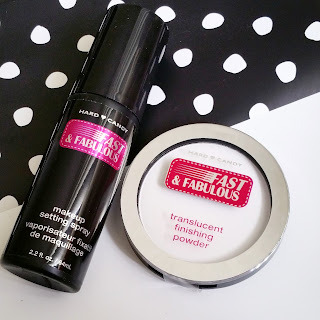 These two products are part of the Hard Candy's Fast & Fabulous line. One is a makeup setting spray and the other is a translucent finishing powder. Both can finishing your makeup look and set everything nicely. I have more on these two products below! Hard Candy Fast & Fabulous Oil Control Makeup Setting Powder ($6)- A weightless, translucent finishing powder that provides an invisible way to set and extend makeup wear. This oil absorbing formula reduces shine while minimizing the look of pores, lines, imperfections. 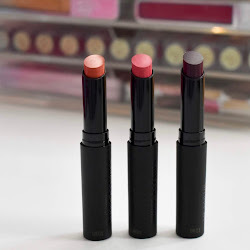 Creates a soft matte finish on skin. Available in one universal shade suitable for a variety of skin tones. This product is great for those that like to use a finishing powder to reduce shine and that can create a matte finish to the skin. The powder is very soft to the touch and it does a great job at keeping oil to a minimum. I didn't find it to be too powdery or not give enough setting power. It did it's job and I was pleased with the way it worked. Hard Candy Fast & Fabulous Makeup Setting Spray ($6) - A weightless spray that locks in makeup for all day wear. Spray over foundation, eye shadow, blush, and concealer to set your makeup look. This setting spray works even in the worst weather conditions and lasts all day and night without melting, cracking, fading, or settling into fine lines. I have used all different types of setting sprays for my makeup, and I would say this would be one of my favorites. Sometimes I think because it's cheaper the spray nozzle will not give a fine mist and be too messy or the bottle itself will leak. I haven't had any of those problems. The spray gives a good enough fine mist where it feels good on the skin and brings the makeup look together at the very end. 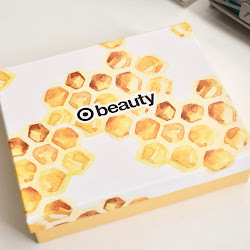 It has kept my makeup looking refreshed throughout the day and has worked like a charm. I'm very happy with the spray. You can get this at a great affordable price and still works just as good as a high end setting spray. Let me know if you have tried these! Event Info: PHAMExpo 2015 + Ticket Giveaway!